Robert C. Higham earned his degree in emergency medical service and spent the six years afterward doing paramedic work. In 1999, he attended and graduated from the Physician Assistant program at the University of Southern California School of Medicine. He went on to attend the University of Nebraska Medical Center and earned his Master’s of Physician Assistant Studies in Dermatology. 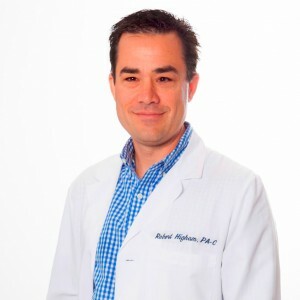 Robert Higham holds a certification from the National Commission on Certification of Physician Assistants. He is a member of Society of Dermatology Physician Assistants and the American Academy of Physician Assistants and is on the board of directors of both organizations. He also serves as the liaison to the American Academy of Dermatology. Mr. Higham and Tiffany, his wife, have three lovely children together. His hobbies include salt water fishing and scuba diving.